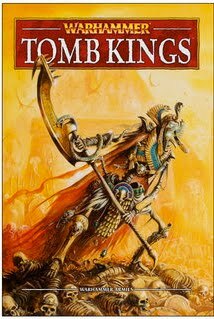 This weekend saw the release of the much anticipated Tomb King army book for 8th edition of Warhamster. The Tomb Kings were in desperate need of an update. The book itself is a nice 96 page hardcover book. It's in full colour and has some nice art in it. But let's get down to the meat of the matter, the content. Please note, this rundown is rather long. I'm going to start with the army special rules. Everything in the army is classified as Nehekharan Undead. Does this make them special undead? No. It just means they're crappier than Vampire Counts undead. VC undead can march whenever they're within 6" of a vampire. Nehekharan undead can march... oh wait. They can't. Ever. And they still can only Hold as a charge reaction, which is rather odd as the fluff now says that they actually are not mindless automatons but are instead animated by the souls of the bodies' original occupant. They should have at least gave them Stand and Shoot or let them march or something so that it actually supports the fluff. Next is the Hierophant rule. This is pretty much the same as before with the following exception: they get a Regeneration save of 6+. A little bit of an improvement but the player still has to tell his opponent which model he is. I've always thought this was stupid. "See this guy here? Yeah, the weak, unarmoured one. Yeah that guy. Kill him and the battle's over". Brilliant. Next up is Resurrecting Undead. This has to be easily one of the worst things in the book. This paragraph dictates the procedure for resurrecting damaged units. In the previous edition, due to the reasonably low number of spells you had, it wasn't easy to rebuild damaged units quickly. Well it just got worse. Previously when you rebuilt units you started with the champion, the rest of the command group and then the rank and file. Now it goes: champion, musician, rank and file. A dead standard bearer cannot be resurrected. Period. And it gets worse. Previously to repair characters you had to nominate them separately. Now characters can't be repaired at all. Later in the spell rules we learn that Constructs can only receive 1 wound per magic phase, which is also worse than before. This whole procedure is massively worse than before. The standard bearer part really needs some clarification. Take for example a High Elf bolt thrower which shoots through a unit of skellies (say 4 ranks of 5). The bolt hits the standard bearer and the 3 guys behind him. All 4 are dead. Now normally you take 4 models from the back of the unit as new skellies step up. So if the standard bearer gets killed this way, does that mean no one can step up to grab the standard? If that's the case then TK standard bearers are hands down the worst in the game. This needs clarification or maybe I'm reading it wrong. Lastly is the Entombed beneath the sands rule. This is the new "It came from below" rule. Units with this rule get the Ambusher special rule which means they randomly show up which is the same as before. The player does get to place them where they want but they still can deviate. And here is how they made it worse: the unit comes up in remaining moves phase. So this rules out popping up and immediately charging. Against gun lines there's now very little point in taking Tomb Swarms or Scorpions as they'll pop up and promptly get blasted apart. The upside is the mishap table is a little better for the Tomb King player. So far I'm not too impressed at all. From what I can see, the army is worse off than before. Let's get to the units. Tomb king/prince- they stayed pretty close to what they were before. The Curse now always works and does d6 S5 or S4 hits. The downside is the Curse wounds can be saved by anything (armour, ward, regen). My Will Be Done lets the unit the character is with use his WS. Okay I guess, it should result in more hits at least. Something I was hoping they would do is let Tomb Princes ride steeds so they could go with the Skeleton Horsemen to make them more effective. But alas, no go. High Liche Priest/Liche Priest- stats were slightly tweaked. They are now wizards and have access to the Lore of Nehekhara, Light or Death. Both of them are a fair bit cheaper to start which is a big improvement. Tomb Herald- this is what the Icon Bearer became. Received a slight tweaking to his stats. He's now Flammable, he also gets the Sworn Bodyguard ability which is basically a "look out sir" for melee combat if they're in the same unit as the character they're protecting. They do have more options to outfit with weapons than the Icon Bearer but as a BSB he's more expensive. Necrotect- this character is basically an undead architect. Yeah it's kind of strange. It has similar stats to a Tomb Herald. They get Hatred which is kind of odd and grant Constructs a Regen save if nearby. Kind of a strange character. Skeleton Warriors/Archers- here's the heart of any Tomb King army. Their Ld got raised by 2 which is awesome as you're probably not going to be resurrecting very many due to the shite resurrecting. Skeleton Warriors are half the cost what they were which is pure awesome and even archers are a little bit cheaper. This is a desperately needed improvement and I think is one of the best things in the book. Skeleton Horsemen- same as before except they get Vanguard and are a tiny bit cheaper. Skeleton Horse Archers- same as before except they get Scout. Chariots- chariots are now always Core. The crew got a slight tweak for the better. The main improvement is Chariots get ranks for 3 minis instead of 5 and they add their rank bonus to the Strength of impact. This is a definite improvement. Unfortunately it comes with a fairly hefty downside in that Chariots are almost 50% more points. The command group cost is cheaper but that's a small consolation. Also they can only have a 25 pt magic banner instead of 50 pts as before. Tomb Guard- same, as before except 1 pt cheaper but can have halberds as an option. Casket of Souls- the Casket I would say is better than it was. First it no longer needs a Liche Priest to man it. This is awesome as it doesn't tie down a character. Second, the death ray itself is not as powerful in that it doesn't automatically hit everything that can see the Casket. I think it on average will do a bit more damage to a unit when it hits. Like chain lightning it can leap to nearby units and damage them too. This is a bit of a downer but honestly I expected it. It also has another bonus in that it adds power dice to the power pool. It's a fair bit cheaper and as far as I'm concerned it's a must in any TK army. Oh, and you can have more than one. Carrion- stat line was tweaked upwards a little, but are the same cost. Tomb Swarm- same as before but a wee bit cheaper. Not as useful now due to not being able to charge when they first pop up. Necropolis Knights- yeah, the snake surfers. I think they look goofy and this is probably the only thing that's stopping me from building them. Maybe they can be modded so they don't look as bad. Combatwise though, they're not goofy. They're actually pretty formidable. The rider is basically a Tomb Guard and the serpent itself is even better. I think they're also the most heavily armoured of any TK unit. Sepulchral Stalkers- these guys can pop up like Tomb Scorpions but unlike Scorpions they don't need to charge into combat as they have a ranged attack that has the potential to be quite powerful depending on the opponent. Stat wise they're like Tomb Guard with some tweaks. Their range attack only has a 8" range and is only S1 but it doesn't attack the targets Toughness, but it's Initiative. To attack they roll the artillery dice for number of automatic hits so they can actually get a ton of hits. And no armour saves with these hits. It's tailor made for splattering dwarves or other undead. I'm going to be probably building these guys as they do look pretty badass. Especially compared to the snake surfers. Ushabti- get a number of stat tweaks, most of them not for the better. They get a BS rating as they can have S6 bows. A rather impressive option. Bye-bye war machines! The book shows 3 models with bows. These models are not the same ones as the existing models, so I think we can expect a new plastic box set somewhere down the line. They're Strength is dropped by 2, but can be compensated if they take great weapons. And their Leadership dropped by 2. Another new thing is they can have a command group which is a nice little bonus. Point wise they were pushed downwards which I think was desperately needed as they were way too high before. Tomb Scorpion- got a slight stat tweak. The main thing as mentioned before is no longer being able to charge on the turn they pop up. Will probably see less of these guys now. Warsphinx- this mini is reasonably similar to the Lizardman Stegadon except tougher. Not only does it have Thunderstomp (being a monster) but it has a Thundercrush attack which is used to crush blocks of troops. It doesn't have the impact hits like the Stegadon but once it does get stuck in, the unit it's fighting is going to have some serious issues surviving. It's going to be great for smashing those annoying hordes. It can be upgraded to give it poisoned attacks or a breath weapon attack. And it's cheaper than the Stegadon by 25 pts. Necrosphinx- where the Warsphinx is meant to kill units, the Necrosphinx is meant for killing large monsters and powerful characters. Oh and it flies. Nuff said. Necrolith Colossus- this is the new name for the Bone Giant. It now has a BS rating because you can give it a bow that functions like a bolt thrower. Think of it as a mobile artillery piece. The stats were tweaked a little bit. Probably the most annoying thing about it is it lost it's heavy armour and now has the same Construct armour save as everything else. Also it is 50 pts cheaper than before (before upgrades). Hierotitans- this Construct is very similar to the Colossus for stats. For equipment it has a couple of bound spells. The main reason for taking this unit is it adds +d3 to any spell cast by a nearby Liche Priest. This makes it a must if you're going all magic, except we don't have a mini for it at this time. I suppose you could use a Bone Giant model as a substitute. Pretty much all the non-skeleton units are Special and Rare, so I would expect EVERY TK army to have their Special and Rare points maxed out. They do have more named characters than before (7 compared to 2). Both Settra and Khalida are still in the book. Settra is all right. Khalida is definitely worse but cheaper. The rest of the characters are rather 'meh'. Except for Arkhan the Black. Stat wise he's not as good as Settra, but when you're a level 5 wizard, you don't care. He's not cheap but I think he's worth every point. Then we come to the spells. Here is probably my biggest disappointment with the new army. How many resurrecting spells do they have and how good are they you ask? Well, they have none. Zero. Zip. What they do have, is every time you successfully cast an augment spell from the Lore of Nehekhara at a friendly TK unit (I'm assuming that even if it gets dispelled the actual spell has been successfully cast, I need to find this out), you get d3+1 points to spend on resurrecting dead guys in the unit that was targeted by the augment spell. Out of the 6 spells and 1 signature spell, 4 of them are augment spells. Not only do the TK not have any actual dedicated resurrecting spells, not even all their spells can activate the Lore attribute! What a joke. The augment spells are okay spells. The two hex spells are kind of interesting and are decent spells. The spell at the top is a magical vortex and is reasonably good. They don't have a magic missile or any direct damage spells unlike EVERY OTHER LORE!!! Agh!!! I guess that's why they can take Lore of Light and Death. Overall the Lore of Nehekhara is kind of disappointing. I think TK armies have to have at least 2 wizards. The Heirophant takes the Lore of Nehekhara while another wizard goes Lore of Light or Death. I do think a magic heavy TK army with at least 1 casket, a Hierotitan and at least 3 Priests would have an awesome magic phase. A TK army with only a Hierophant is pretty useless. Magic items- carrying on the tradition of the first 8th edition army book (O&G), there's only 8 magic items. They're good items and I can see where GW is going with this, they want us to take items from the main rulebook, but it does put them at a disadvantage vs. nonupdated army books. Overall, I'm kind of disappointed with this army book. It seems like it's a lot of "here's your expendable grunt skellies, but look at these shiny Constructs!". The units themselves are pretty good, but the core principle of being able to rebuild your army as it fights is rather worse than before. The army is definitely not a point-and-click army like Daemons and Vampire Counts were in 7th edition. I spent a good 6 hours going over the book and typing up this review, but I haven't actually played with it yet. Hopefully soon. EDIT: I need to add that the army is more flexible than it was before. A TK player has lots more choices to pick from, which is a definite positive. Heck of a review...very detailed! Overall, I get the impression you're not happy with the new book. I'm internested to see how the army performs now, however. I might have come off a little harsh. I like the units and the character options. I don't like what they did with the army specific rules especially resurrecting. I think it damages the flavour and the reason for being of the army. The TK specific Lore was rather disappointing too. I'm hoping the tweaking to the units and the new units will compensate for this though. Still need to find out more in regards to the standard bearer thing. I am looking forward to getting games in once I get some more constructs. Of course, more choice = buy more!!! Yeah, you're probably right. I need to get some games in.